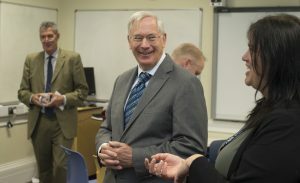 The Duke of Gloucester, the Queen’s cousin visited the school today to find out more about the unique work by teachers to boost science, technology, engineering and maths skills and careers in the South West. Exeter Mathematics School, which opened in 2014, is one of only two specialist schools for enthusiastic young mathematicians and scientists in England. The sixth form offers young people in the South West who show potential to do well in STEM subjects the chance to study in an exciting and challenging environment, and work with leading academics at the University of Exeter. Students who live too far away to commute daily live together in supervised accommodation during the week. 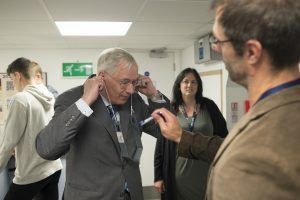 The Duke spent time speaking to students who have recently completed a project with the technology company Dyson and also toured classrooms, including the physics laboratory where he was able to test equipment. The Duke asked about the school’s curriculum and how the teaching of maths had changed thanks to new computer technology. He was also interested in the history of the famous mathematicians quoted in large graphics in the school’s classrooms and in the career choices of students. Exeter Mathematics School headteacher Kerry Burnham said: “Our students are likely to pursue careers which don’t yet exist, so it’s vital that they are able to adapt. Our curriculum helps them to be innovative and entrepreneurial. Although the majority of students go on to university our main focus is to provide the opportunity to continue explore the subjects they are passionate about in an inspiring and enjoyable way. Students at the school are given careers guidance and undertake regular industry placements. 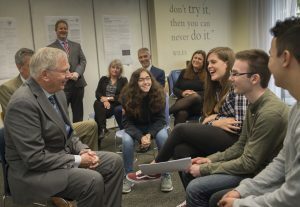 Alongside A-levels they complete the Exeter Mathematics Certificate, where they undertake research projects alongside academics from the University of Exeter and with industries such as the National Hydrographic Office, the Met Office and Dyson. They present their findings through lectures at the University. Dyson staff set students a challenge to come up with theoretical ideas for making a different version of their robot vacuum cleaner, and reducing engine noise. Professor Pete Vukusic, Associate Dean for Education of the University of Exeter’s College of Mathematics, Engineering and Physical Sciences, said: “The University is delighted to be able to support the wonderful work done at Exeter Mathematics School through provision of staff time, use of facilities and the running of the Exeter Mathematics Certificate.